The taste of your cooked dishes depends heavily on the freshness and quality of spices used in them. Ever wondered how long you can store spices in your kitchen? If you buy ready-to-use spice mixes, the label on the packet will give the shelf-life of the mix. But if you make your masala at home, you need to be sure that the spices have not lost their potency. 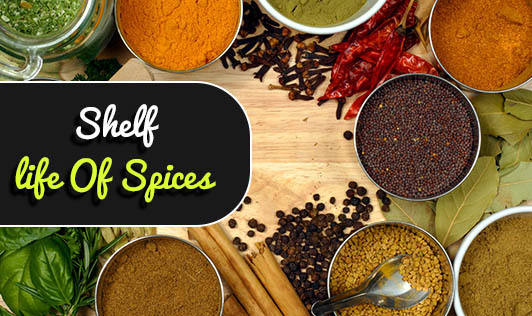 Generally, most dry spices like jeera, methi, mustard, cardamum, bayleaf, haldi, pepper, etc, last for about a year. Whole spices keep longer than ground spices. Fresh spices like green chillies, ginger, garlic last only for a few days. Store spices in air-tight containers in a cool place. Avoid hot or humid racks. Preferably store them in glass or stainless steel containers. If you wish to keep them for a long time, refrigerate them. To check if the stored spices are usable, gently the shake the closed container; open the lid and smell the spice. If the rich smell of the spice is still present, it's good for use. Do not shake the spice out of the bottle into something that you're cooking directly because moisture can get into the bottle. Spoon out the spice into the dish. Fresh spices that spoil easily should be refrigerated and used as soon as possible.